1.) Aim high. No, higher. Completely out of reach from those sticky toddler hands. 2.) Soft and plastic. Turn toys into decorations using stuffed animals or Little People holiday toys. 3.) Get your kids involved and crafting! 4.) Gordman's, TJ Max, and Target Dollar Section are my fave places to score some awesome decorations for every season. Gordman's usually has an excellent selection of all kind of decor (breakable, kid friendly, candles, wreaths, and more) and Target Dollar Section always has decor that is kid friendly....and it's cheap too so when they do destroy it I don't feel guilty for spending the money on it. 5.) Check out Michael's craft stores for seasonal and holiday craft items. When we went last weekend, all Halloween and Thanksgiving crafts were 40% off. A good amount of our decorations are things the kids have put together, colored, and painted. On top of the entertainment console and within grabbing distance of the kids sits their favorite sensory activity of all: the gourds and a trick or treating pumpkin bucket filled with Indian corn. I did make the rule that if they want to play with it they must ask first and they must be sitting on the floor in the designated "gourd and pumpkin area." Not only is this great for fall and Halloween, but it allows the kids to touch and play. We can also keep these corns and pumpkins out after Halloween thanks to a turkey bucket I found in the Target dollar section. This spider craft was incredibly cute and a hit with the kids and parents. Have kids paint or color a paper plate black, attach googly eyes, use a piece of black construction paper to cut out 8 strips of paper for the legs, and tape on the back. I made a small hole to loop white string through and tied the spider by his web from the ceiling fan. I scored a package of spider webs in the Target dollar section and cut in into three different sections. I put one on the fan (the kids loved talking about how the spider spun a web and I didn't clean it) and two more on our bushes in the front yard. Yes, I stuck a giant fake spider in the web.....this freaks the kids out more than any other decoration we have up! I went to Gordman's and nabbed a couple of cute signs (the one of the door for $8 and the Boo sign for $5). Most of my holiday and seasonal decorations come from Gordman's because everything is beyond cute and at an excellent price. Before you open our front door, you're warned of the witch who lives here....and open the door to find her broom! The broom is courtesy of digging in the Target dollar section for stickers only to pull out the broom handle. We buy all of our seasonal crafts from Michael's craft stores. I scored a thick cardboard witch hat and a wooden Frankenstein face for 40% off regular price. At the beginning of the week, I had all of the kids help paint them. I was hoping to put the witches hat inside the front door next to the broomstick, but the wooden hat wouldn't stay on the hook. So instead we made a witch lamp. She lights up! 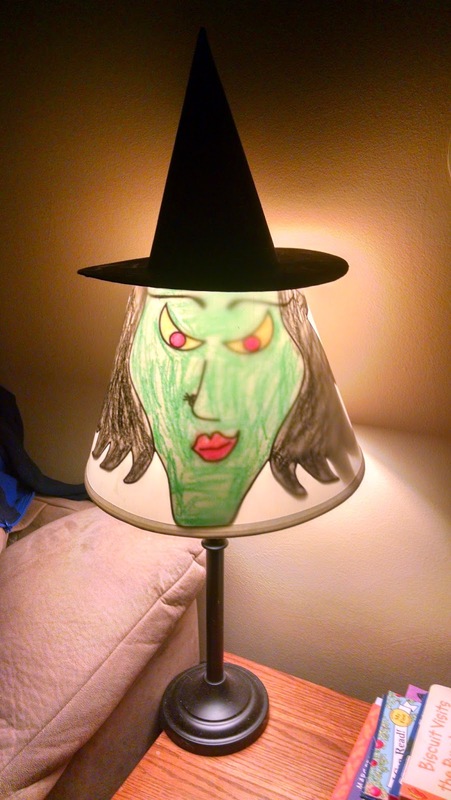 I had the kids color a printable witches face (type Halloween coloring printouts and you'll get a list of websites you can print for free from), cut it out, and taped it to the inside of the lamp. 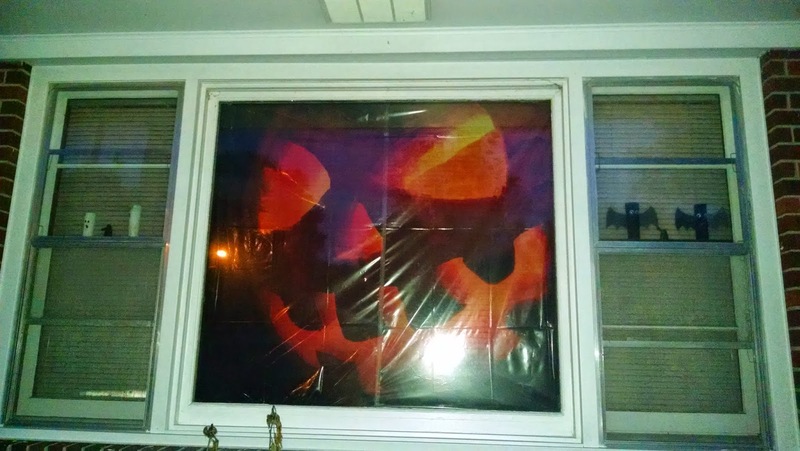 The Frankenstein head went in the window with fall window clings (found at Dollar Tree) and a pumpkin border (also found at Dollar Tree). We downloaded and printed out several different Halloween pictures for the kids to color. It's been a busy week of coloring, cutting, and taping to the wall around the mirror, but it's slowly coming together. The kids are pretty proud to see their work up on the walls! I scored these stuffed felt pumpkins from the Target dollar section. I have these sitting on a shelf eye level with the kiddos. They love having pumpkins that can be thrown around. They're cheaply made (they were a dollar a piece so not surprising) so I predict they won't be around for long, but if they make it, they'll be out for decoration until Thanksgiving. This high, up out of the reach of children, is usually filled with my breakable Isobel Bloom figurines, but I put those safely away for the season and put my kid's crafts out. We have a glitter pumpkin (the foam pumpkin was found in the Target dollar section and sprinkled with a lot of glitter), the foam candy house was built by Max (found at Michael's for only $8), and the wooden coffin (.50 cents at Michael's) was painted and filled with ghost erasers ($1 at Target). The kid's toilet paper roll ghosts and bats (read how to make your's here: http://ashlen-kidspert.blogspot.com/2014/09/toilet-paper-roll-ghosts.html and http://ashlen-kidspert.blogspot.com/2014/10/toilet-paper-roll-bats.html) are displayed in the small windows and the large pumpkin head looking out glows orange (Hub's was pretty proud of this find at Menard's). I must admit, I usually put off decorating for the holidays because I fail miserably at taking it down in a reasonable amount of time (yes, we are always the house with our Christmas decorations up until February). This year the kids pushed me to do the Halloween decorations and I am so glad I did. We've had a great time and kept super busy crafting, coloring, shopping, and decorating our way through the week. I also don't feel like I destroyed our budget buying decorations since the kids made most of them. If you still have yet to decorate for the season, I suggest checking out Michael's craft stores as they have a good selection of a lot of items (and more importantly, all of their Halloween items will be only sale for at least 40%). Now that we've (almost) finished decorating for Halloween, my kids asked: "when do we wear costumes and put the candy out???"